I always thought the Hagia Sophia dominated Istanbul’s skyline. But there is a mosque every direction you look, and when I first arrived in the city I wasn’t even sure which one was the Hagia Sophia! 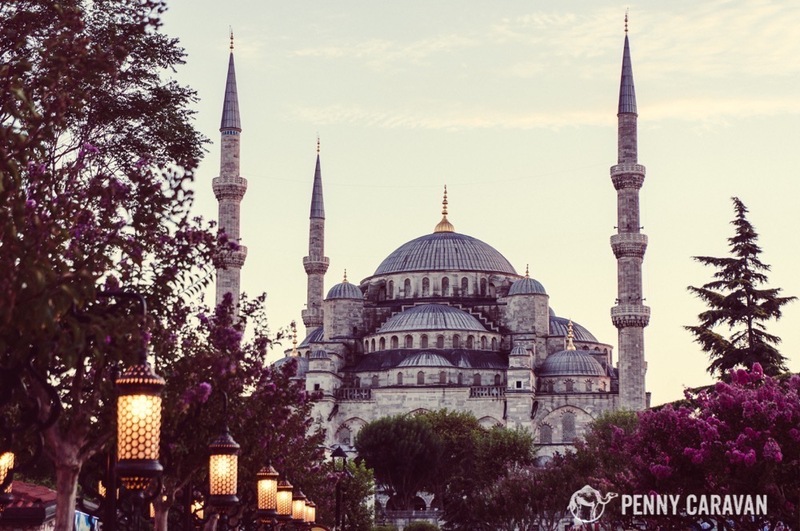 This post will help you differentiate the holy sites of Istanbul and better plan your own visit. All the mosques are free to visit as they are in active use, so while there will be swarms of tourists snapping photos, please be respectful, keep it quiet, and be mindful of worshippers. 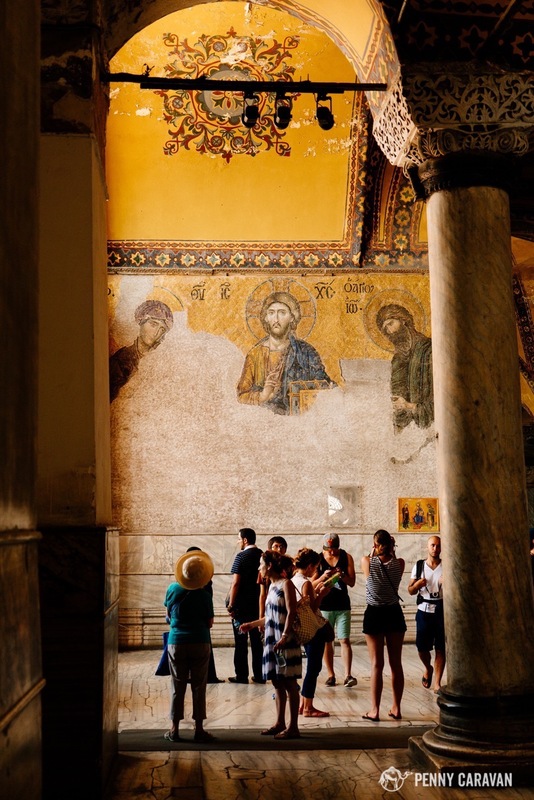 Visiting the Hagia Sophia and the Chora Church requires a ticket purchase, but both are also included in the Istanbul Museum Pass. 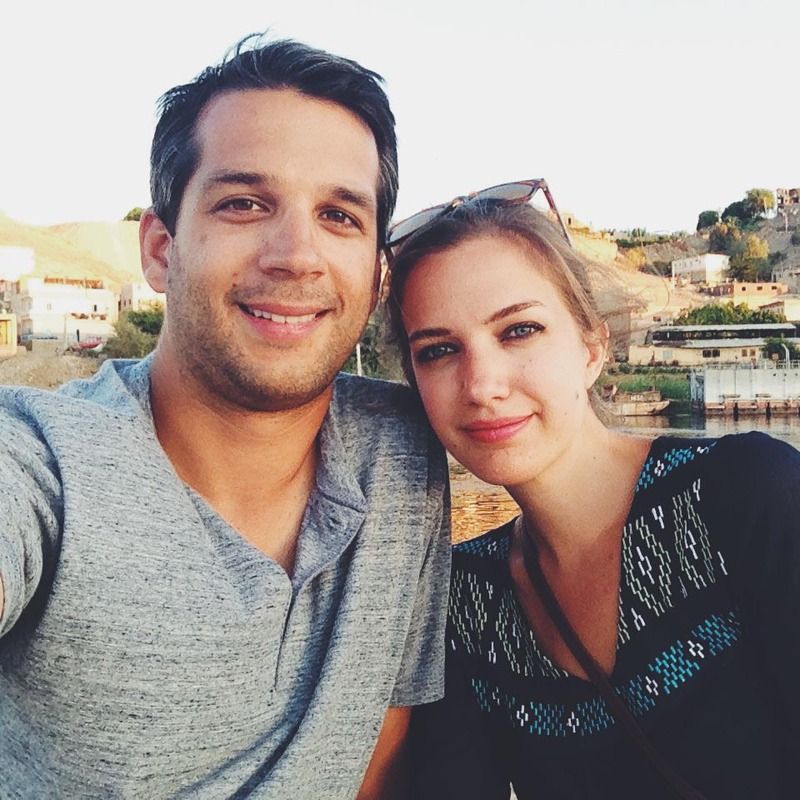 There are a few general guidelines on visiting Islamic holy sites. Everyone removes their shoes before entering. Men need to wear pants and a modest shirt (no sleeveless). Women should wear a long skirt, long sleeves, and a head covering. I find that wearing a summer scarf makes for a great impromptu head covering. If you’re visiting in the summer when it’s miserably hot, it may be a good idea to plan all of your mosque visits on the same day so you only have to dress this way once. But of course, every mosque is ready to wrap you up from head to toe, should you drop in completely unprepared. They have velcro wrap skirts, shawls, and head coverings. Even men get outfitted in a skirt if they show up in shorts. 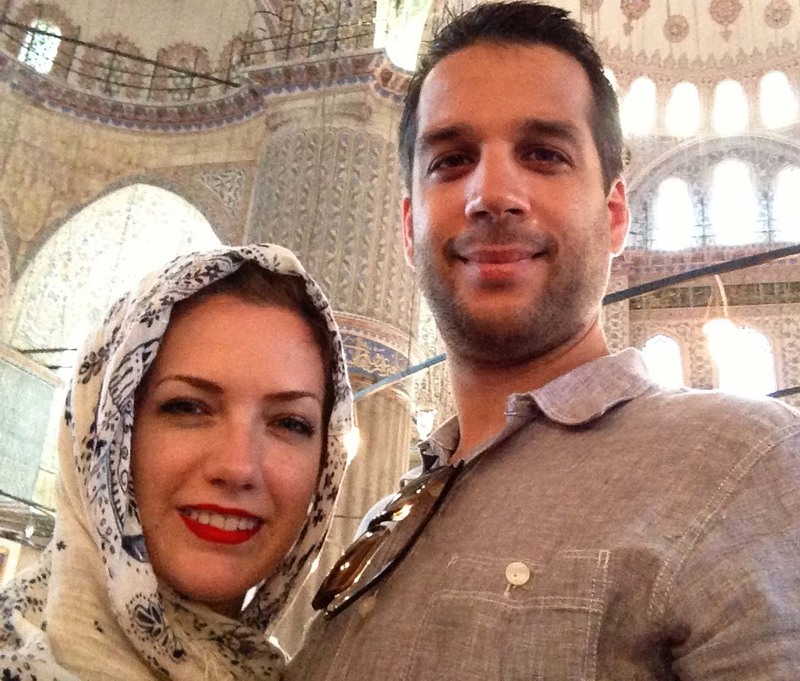 Shane and I inside the Blue Mosque. Yes, selfies are allowed! 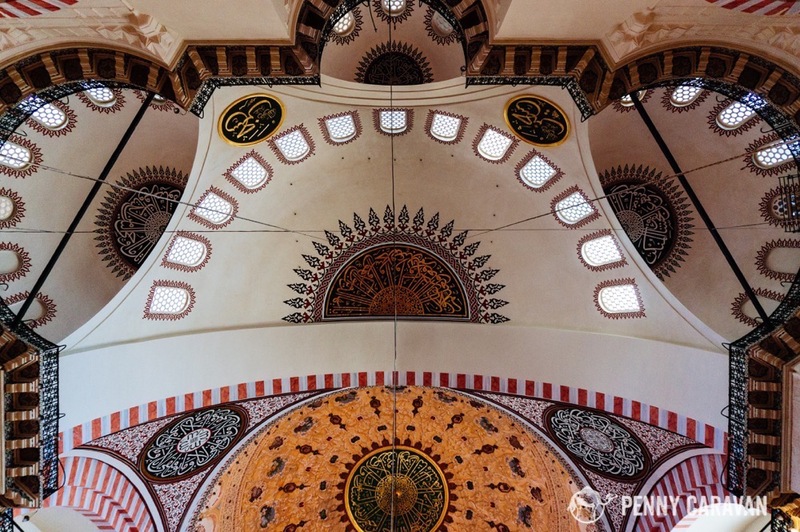 This architectural masterpiece is Istanbul’s main attraction. 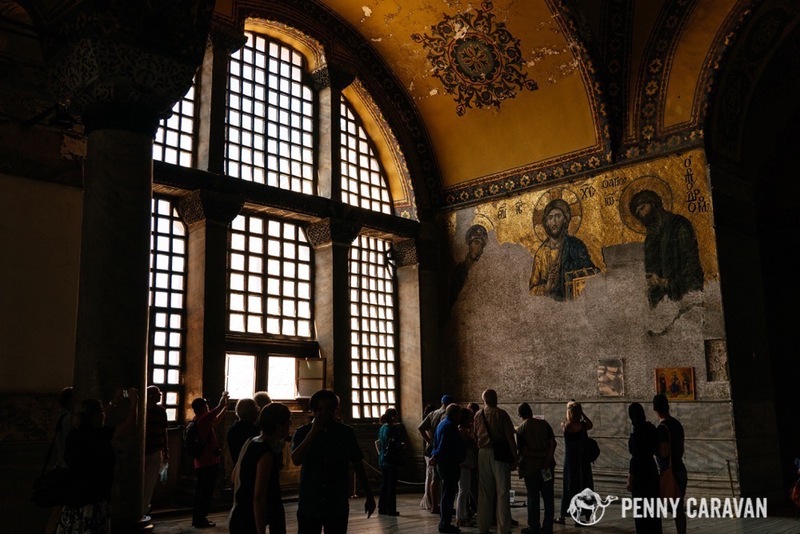 Built in 537 as a Greek Orthodox Cathedral, it was the seat of the Byzantine Patriarch for hundreds of years. Hours after the Ottoman occupation of the 1400s, it was converted to a mosque. Finally, after the Turkish revolution of the early 20th century, it became a museum. 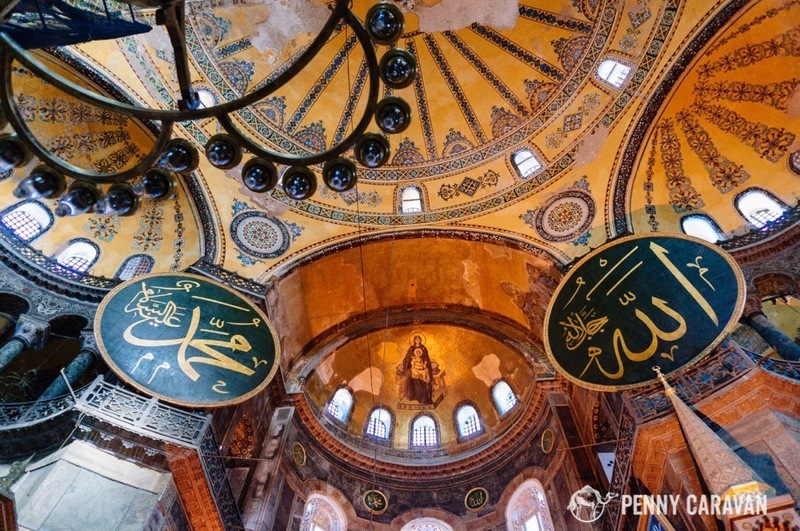 The interior is unique and inspiring in that you can see Christian and Islamic icons co-existing. 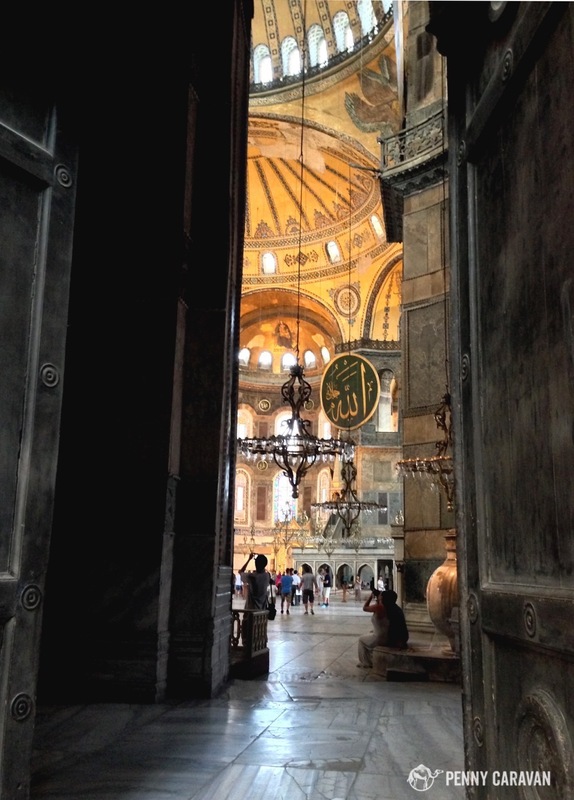 This was my first peek into the Hagia Sophia and I’m pretty sure I gasped loudly! 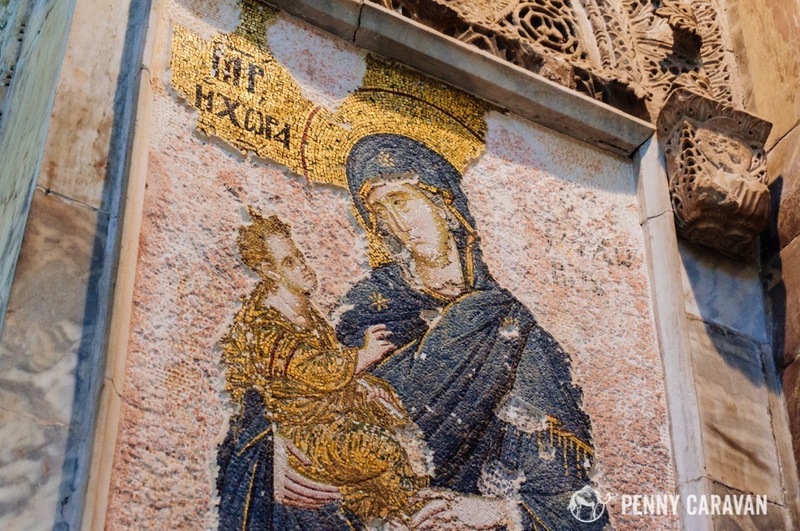 Here you can see the Virgin and Child mosaic in the center of the photo. The Christ Pantocrator Mosaic on the second floor. 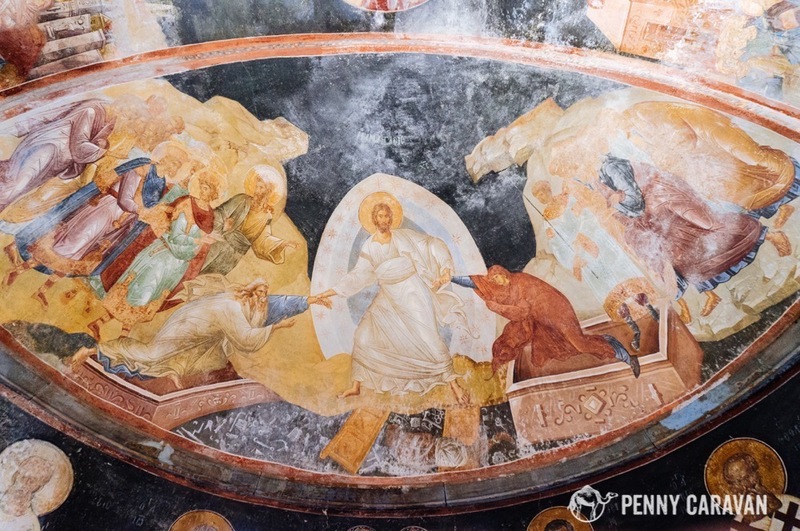 The lighting on the Christ Pantocrator mosaic is so powerful, and the mosaic artistry so detailed, it absolutely brought tears to my eyes and sent shivers down my back. Scaffolding for some restoration work on the left side prohibited our view of the entire interior. 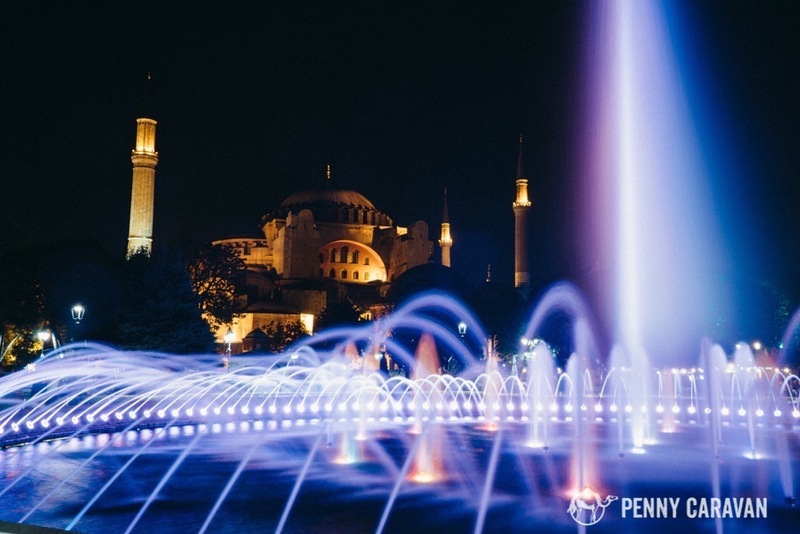 The fountain in front of the Hagia Sophia makes for some beautiful photos! 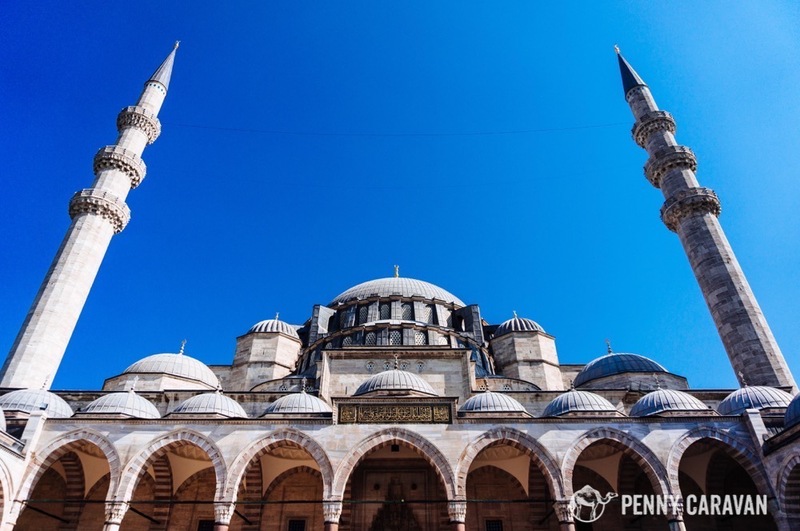 The most famous mosque in Istanbul is located just across the square from the Hagia Sophia. You can tell them apart by noting that this mosque has six minarets, while the Hagia Sophia has only four. It was built in 1609 by Sultan Ahmet, but it is commonly known as the Blue Mosque because of the 20,000 handmade Iznik ceramic tiles that decorate the interior. Iznik tiles are typically painted with blue tulip designs. Fun fact: tulips are native to Turkey and were imported to Holland in the 16th century. The Blue Mosque at dusk. The path between it and the Hagia Sophia is lined with lanterns, flowers, and snack vendors! 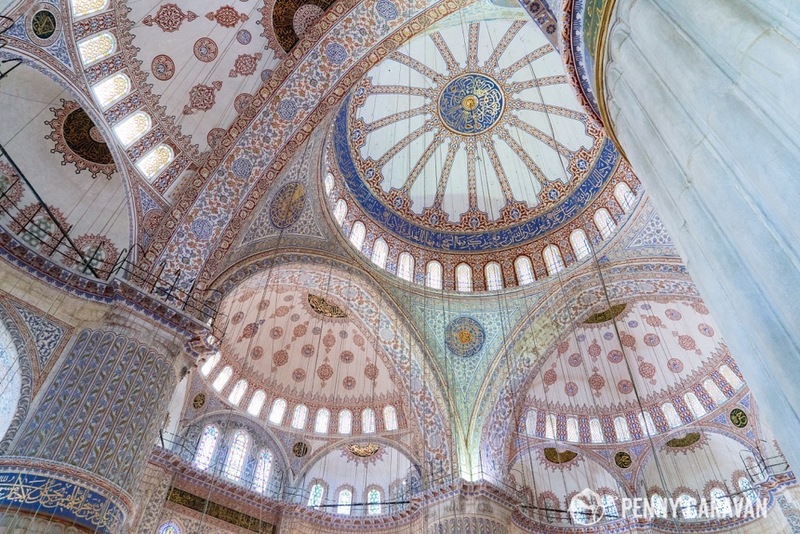 The blue tiled interior of the Sultan Ahmet Mosque gives it the nickname “Blue Mosque”. The Blue Mosque gets very crowded! On our second visit to this mosque, we were approached by a friendly guy who offered to show us around. 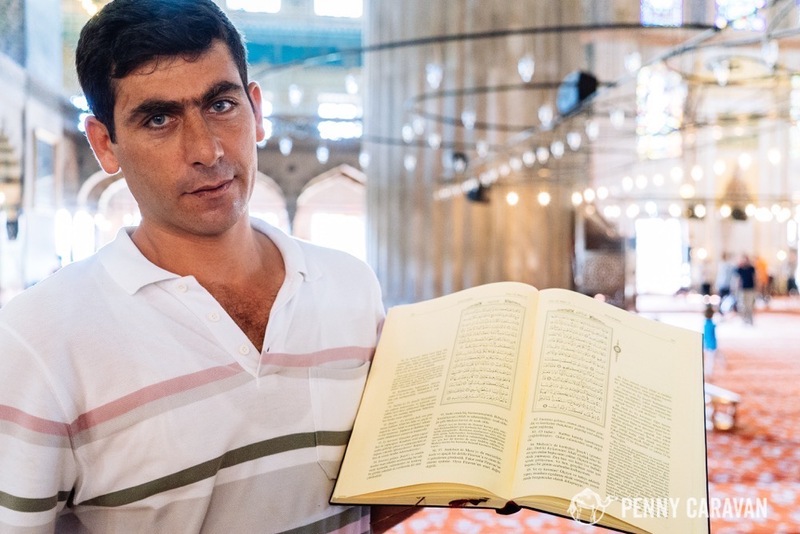 He insisted that he’s worked at the mosque for 20 years and that this was a free service to show tourists around and to help them understand Islam. We politely declined, knowing he was probably in this for a tip, but he continued to talk to us and wouldn’t leave our side, basically making it impossible for us to say no. We figured we would give him a few lira when we left, but in the end he surprised us by absolutely declining a tip. Instead, it was a visit to his cousin’s nearby carpet shop that he was after. Poor guy, he picked the wrong people! When we tell them we’re from Texas they say, “Texans have BIG houses, you need a BIG carpet!” And they know—many of them go to the Round Top Antiques Show! But it’s easy for us to get away from carpet salesmen by telling them we spent all our money on a ticket to Istanbul. It’s the truth, and it makes them smile that we wanted to visit their city that bad. The reality is that the cost of a large area rug in one of their shops is about what we spent on our entire trip to Turkey. But we did end up visiting the carpet shop and had a cup of tea and nice conversation. And we wished him the best of luck on his next try. Inevitably this will happen to you as well, so our advice is to relax and enjoy the hospitality while politely declining their sales advances. Zaki showing us around the Blue Mosque. Don’t let the name fool you—this mosque is more than 350 years old. The original Valide Sultan Mosque that stood in this location was damaged in the great fire of Istanbul in 1660. When it was rebuilt in 1663 along with the construction of the Spice Bazaar, it was nicknamed the New Mosque. 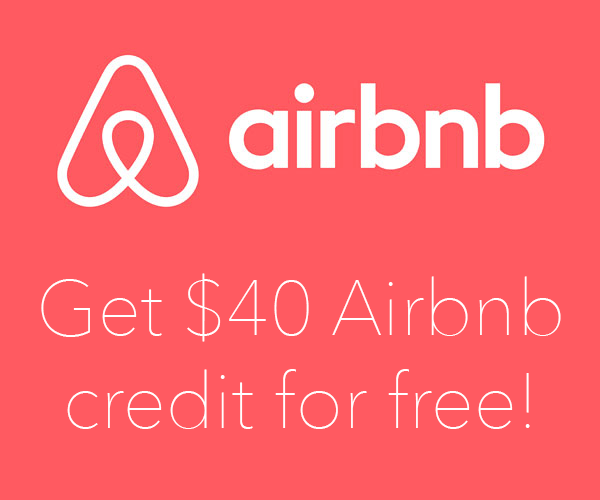 It is located right on the Golden Horn next to Galata Bridge and the Spice Bazaar. 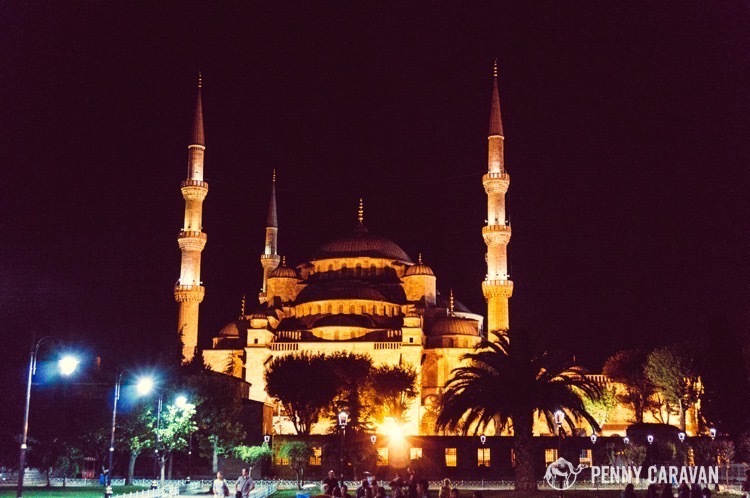 This is the largest mosque in Istanbul and is located near the University. 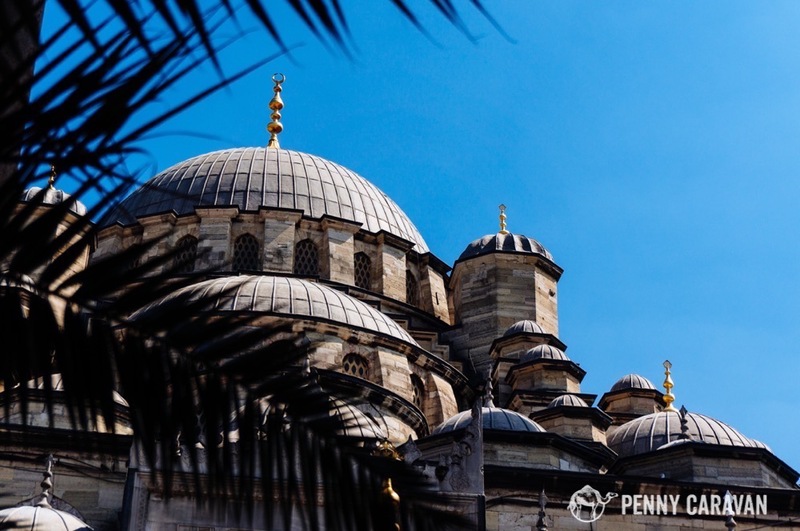 It was built in 1550 for the Sultan Süleyman by Sinan, who was something of an architectural genius. This building is his most famous work. 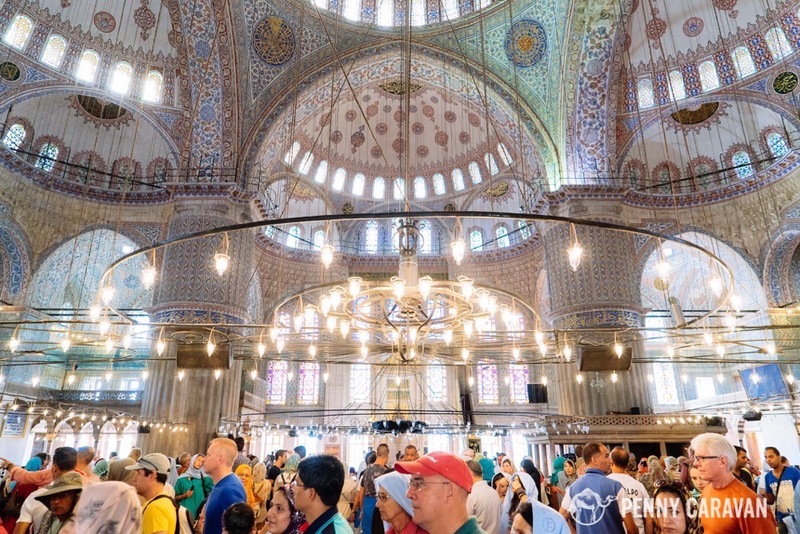 It is every bit as interesting and intricate as the Blue Mosque, plus it’s older, and far less crowded! 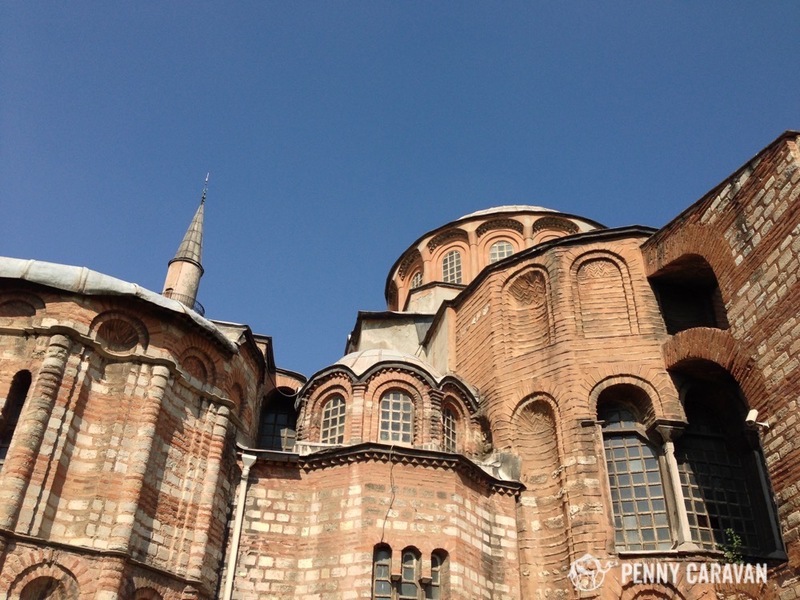 This is another Byzantine-era church that was converted to a mosque during the Ottoman occupation and is now a museum. It was built originally in the 5th century as part of a monastery complex outside the walls of the city, but the current building was constructed in 1077. The interior was very well preserved even throughout the Ottoman occupation, making it a fine example of Byzantine art. 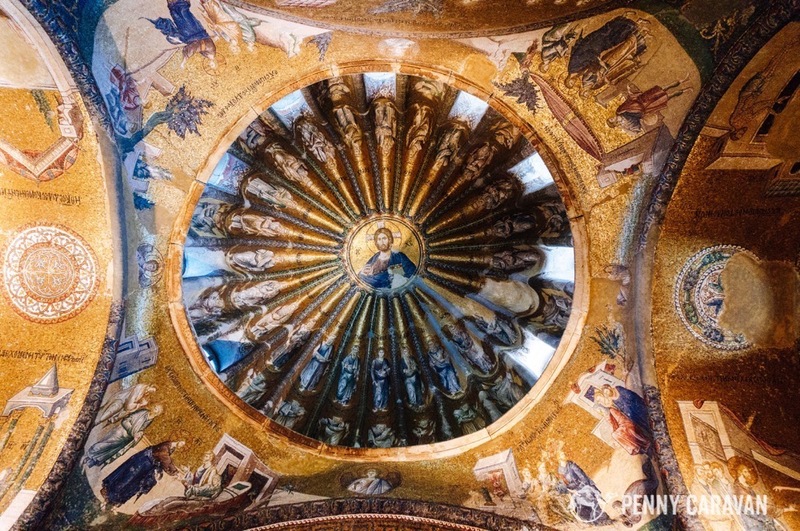 Mosaic dome of Christ Pantocrator. 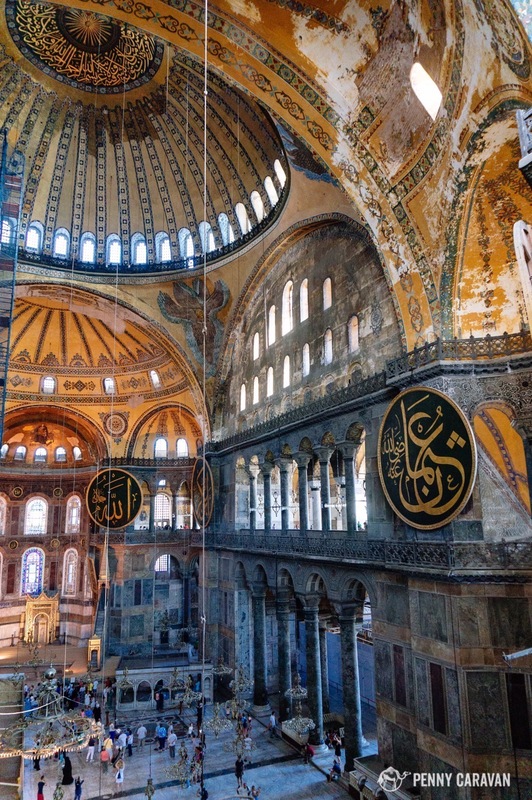 National Geographic said if you only visit one mosque in Istanbul, make it this one. And I might have to agree because although it’s smaller than most, it’s much more intimate and never crowded. 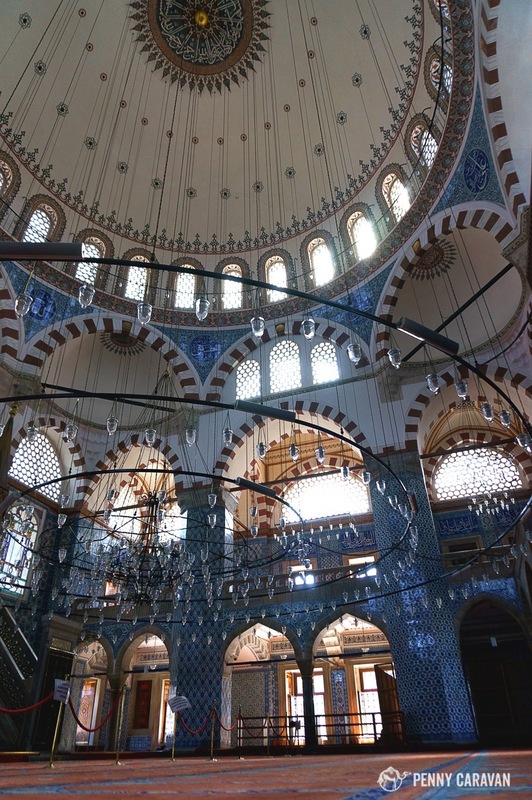 The interior is covered with more than 80 different patterns of Iznik tile. Built in 1561 by the great architect Sinan, the mosque sits on top of some shops in a neighborhood near the Spice Bazaar. This one is kind of hard to find, so when you’re among the cafes below, look between the shops for a simple doorway with a plaque and a ramp going to the second level. You may have to ask directions, but everyone will surely be glad to help. 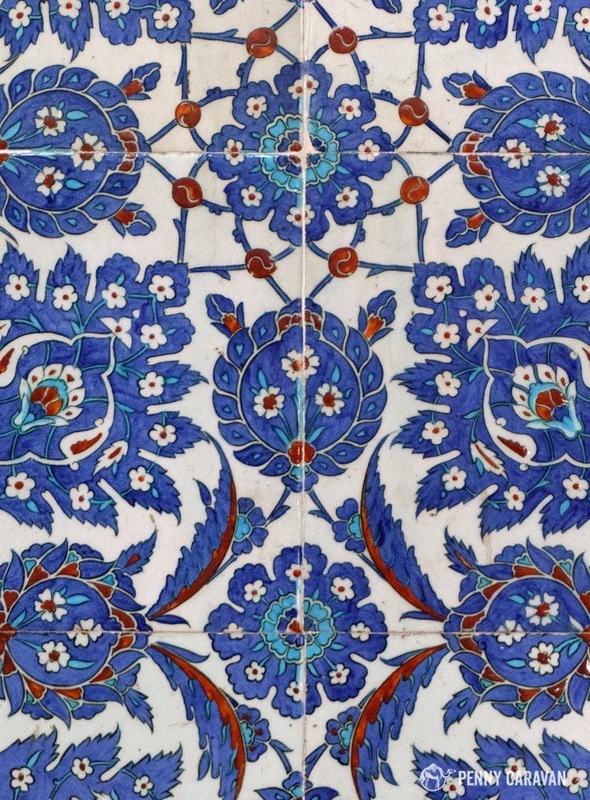 Rustem Pasha displays 80 different patterns of Blue Iznik ceramic tiles. 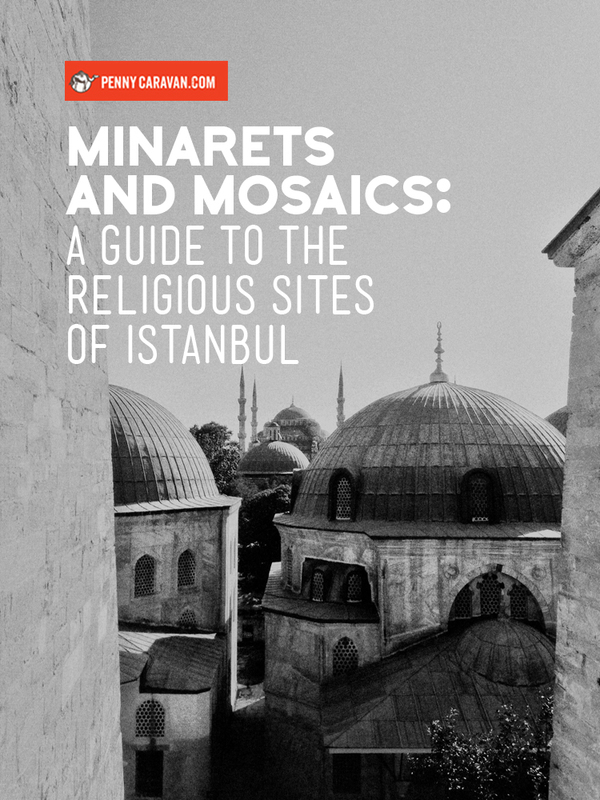 As a religious person who is very interested in history, seeing these sites made for my absolute favorite experiences in Istanbul. 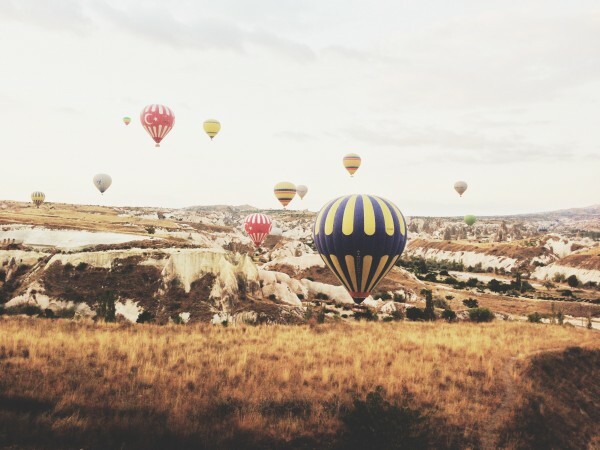 This is far from an an exhaustive list, as there are countless spires piercing the sky above Istanbul, but these are ones you definitely won’t want to miss. Be sure to watch our video for more interior shots of all the sites between minutes 3:00-5:00. And if you like this post, help us out an pin the picture below!